Once you are done with the Income Tax e-filing, the acknowledgement form will be available for download normally in 2-7 days depends on the portal through which you filed your return. You need to download, sign and send the Income Tax Return Verification Form(ITR-V) to the Income Tax department within 120 days of submission via ordinary post or speed post only. The ITR-V is printed through Jet/Laser printer and not from a Dot Matrix printer. The ITR-V is printed in a A4 size paper. Print should be clear and in black ink only. The signature is done by the return filer only and should be in blue ink only. Nothing is written by the return filer on ITR-V except for the signature. The ITR-V is original signed copy and not a photo-copy or scanned copy. No other document is stapled or attached along with the ITR-V. The paper should not be perforated or folded at all. Nothing is printed on the back of the ITR-V. The ITR-V is to be sent via Ordinary Post or Speed Post only. "I further declare that I am making this return _____________ in my capacity as and I am also competent to make this return and verify it." In case of Individual it can be 'Your Name', Individual' or Authorized Signatory or leave this field blank. The receipt of this ITR-V at ITD-CPC will be sent to your e-mail address you used while filing your IT-return. The information provided in this article is only for your information. Please contact a chartered accountant or a tax professional before filing your returns. 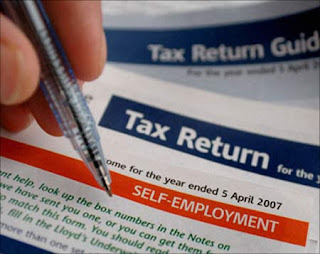 I'm not in India now for the financial year 2011-12, so there is no tax for me. But I got tax on interest that my bank has paid to Govt. Still should I file the tax returns to Govt. For non-resident Indians tax filing is needed only if the income earned from India exceeds the income tax limits OR any short-term or long-term capital gains earned from sale of any investments or assets in India. Hope this help! Ragarding "I am making this return in my capacity as...." In ITR-V, AY 2013-2014, I called up IT dept. they said Nothing other than sign should be entered. I am an Individual. Please keep "I am making this return in my capacity as..." ... as blank. If you are an individual and just sign. It is also mentioned that you should not fold the doc. This means that the fold should not be on the BAR code that is printer on the doc. If the fold is on the bar code the doc will not be able to be scanned. You are right, individuals may leave this field blank. Helpful totally. Simple and crisp. I liked the post, this is the second time I am filling from myself only through cleartax.in. They have generated a ITR-V form for me which I have signed. How will the tax guys know in which account they will deposit the money? Where do I mention it.